His real name was Orest Rusnak. He was of Ukrainian descent and took part in the First World War as an officer of the Austrian-Hungarian army. In 1917 he fell into Russian war. Here he excited sensation singing Ukrainian songs in camp evenings. After his dismissal he began in 1918 his education under Eugene Fuchs in Prague. He made his debut in 1923 at the Municipal Theater of Olmütz (Olomouc) as Rodolfo in ‘’La Bohème’’. In the 1924-1926 seasons he appeared at the Municipal Theater in Königsberg, from 1926 to 1927 at the Municipal Theater of Szczecin. 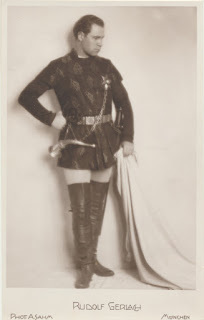 After additional education with Jacques Stückgold in Berlin and with Lari in Milan he became a soloist of the Municipal Theater of Chemnitz (1928-1930). In the 1930-1931 season he was engaged by the Municipal Theater of Graz. Since 1931 he was a principal tenor of the Munich State Opera and started to appear under the name Rudolf Gerlach-Rusnak. He formed his artistic name Rudolf Gerlach-Rusnak from the name of his favorite hero, the Rudolf in ‘’La Bohème’’ and the family name of his wife Elisabeth Gerlach. Till 1937 he remained a member of the Munich Opera, where he also performed in the premiere of the opera ‘’Lucedia’’ by Vittorio Giannini (1934). In 1938 he made guest appearance at the Vienna State Opera. In the 1941-1942 season he was engaged by the Municipal Theater in Bremen, in the 1942-1944 seasons he was a soloist of the Municipal Theater in Innsbruck. In 1945 he joined again to the Munich Opera. After a cardiac infarction in 1946 he remained ill, however, undertook in the 1956-1957 season again a tour through Canada and the USA.